We meet lots of founders - almost all of whom are smart. In fact, they are very smart. The type of smart that can be filed under what we know as IQ (or Intelligence Quotient). Some people might think this is just a soft skill they can skip over, and that their IQ smarts will help them outwit their competitors to make their way to the top. Emotional intelligence is not just a nice-to-have — but crucial to building a successful and sustainable business. 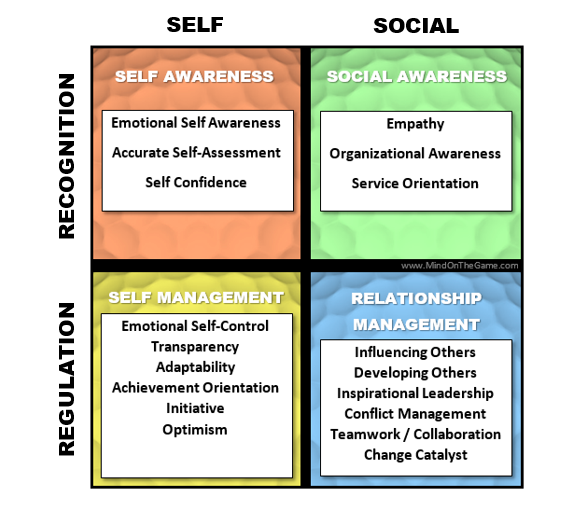 Emotional intelligence is the ability to identify your emotions (and others’) and to manage them. Emotional intelligence originates from the neurotransmitters in the limbic system of our brains, which controls feelings, impulses, and drives. (This is very different from what happens in our neocortex, which governs the analytical, technical, and logic). According to leading Emotional Intelligence author and expert, Daniel Goleman, there are 4 dimensions of EQ and 18 contributing elements. Below is his updated competency model from Primal Leadership: Transforming Leadership From Art to Science. The good news is that you can develop emotional fitness just as you do physical fitness. Yes, you can train your brain, not just your body. As part of his extensive research on EQ, Goleman studied competency tests across 188 companies, and emotional intelligence proved out to be twice as important as IQ or technical skills. Once you get past a threshold IQ, research shows that for jobs of all kinds, at all levels, on average, emotional intelligence is twice as important as cognitive ability in terms of the distinguishing competencies that make great leaders. We suggest that all leaders spend time assessing their capabilities across each of the 18 EQ elements. Upon reflection, it should be easy to understand why each element is important to master. In fact, if you are thinking that these elements read like a checklist of skills that investors are looking for in founders and founding teams - you are correct. EQ comes into play in both how you show up as a leader and how you interact as a leader. And the bigger your team and company gets, the more your Emotional Intelligence is tested. Take a moment now and ask yourself which of the 18 elements are strengths and which are weaknesses. - How good are you at managing yourself and your own emotions? At handling the pressures and fears of startup life? - How well do you deal with and navigate all the personalities, work styles, and needs of your employees? Investors? Board Members? Partners? - How good are you at communicating effectively? How strong of a listener are you? - How skilled are you at conflict management? - Do you lead by bringing out the best in people? Developing a high EQ is no easy feat, yet it is completely do-able. It requires deep self-awareness coupled with strong discipline and consistent practice. The payoff, in turn, is immense - as improving your emotional intelligence will bring you both greater business and personal success. Still Thinking You Can Ignore The Soft Stuff? We work with a lot of engineers, so we understand the importance of speaking the language of data. In 2008, Google initiated Project Oxygen, a deep review of a decade-plus of people analytics, to assess what makes the best managers. To the company’s surprise, technical skill ranked dead last in a list of 8 qualities of great managers. Ahead of it were softs skills like empathy, coaching, communicating well, possessing insights into others, and developing others. In 2012, Google embarked upon another data-driven initiative - this time called Project Aristotle. A team of statisticians, sociologists, organizational behaviorists, and engineers spent 2 years reviewing 180 teams to figure out what drives the most successful teams. They found that one of the biggest contributing factors to the most effective teams was Psychological Safety - which boils down to good old trust, empathy and social sensitivity. Once again the results had more to do with EQ than IQ. Founders - it’s time to take a serious look at your Emotional Intelligence (and your team’s). And Silicon Valley - it is past time that you got comfortable talking about emotions and soft skills in the workplace. In the 21st century, companies (and investors) that understand EQ > IQ will be the winners. Sign up for our newsletter below to get exclusive content on how to improve your EQ. Click the link to download our FREE Peak Performance Worksheet. Older PostFounders - What’s Your Peak Performance Recipe?